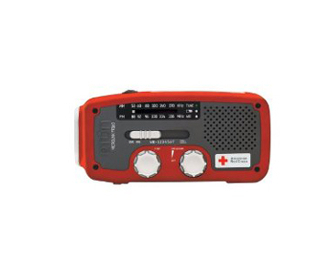 The American Red Cross MICROLINK FR160 by Eton does more than keep you connected. This new spin on an classic incorporates our award winning design and standard feature sets into a sleek easy to use package. It is a multifunctional, ultra-compact companion ready for any preparedness kit. When emergencies or outdoor adventures take you off the grid, you need a device that can fill multiple needs. The American Red Cross MICROLINK FR160 is so compact that you can easily store in a safety kit or toss in your rucksack and take anywhere. It has a high-quality AM/FM tuner, providing you with news, entertainment and public service announcements. Not only that, but it also integrates a NOAA Weather Band receiver that brings you weather forecasts, alerts and other emergency messages information vital during severe weather conditions. At only 5.25 inches, the MICROLINK FR160 literally fits in the palm of your hand. It also includes a powerful solar panel, which gives you the freedom to explore without the hassle of batteries or adapters. If that wasn't enough, we also added a full sized USB port to easily charge any small electrical device such as an mp3 player or cell phone. You'll always know what is going on, thanks to the AM, FM and NOAA Weather Band tuners. With the additional flashlight and cell phone charger, you can't go wrong with the MICROLINK as it is one versatile little device. No one likes to think about disaster, but being prepared can make chances of surviving one much greater. Included with the purchase of this product is an American Red Cross preparedness guide as well as a donation to the American Red Cross.